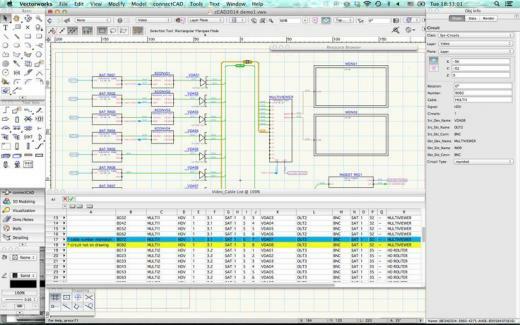 connectCAD is a software add-on to the Vectorworks platform for designing broadcast, audio-visual, lighting, IT cabling, and other connected systems. It solves the problem of keeping track of large numbers of cables or other interconnected systems in a complex installation. Realizing your ideas is as quick and easy as drawing on a table napkin. Behind the scenes, our software takes care of the details and gives you error checking, cable labeling, and cable reports ready for installation in just a few clicks. Keeping drawings up to date as changes occur has never been easier. Our tools let you add and edit information at any stage, highlight changes and even revise your design automatically. Vectorworks and connectCAD combined provide the ultimate systems engineering tool: advanced connectivity design, superb 2D and 3D drafting, stunning visualization.